Light quality is a crucial aspect of healthy plant development. That term "quality" refers to the composition of the light produced. How much red is emitted in relation to blues, greens or any other color? More and more people are turning to artificial lighting for plant production. 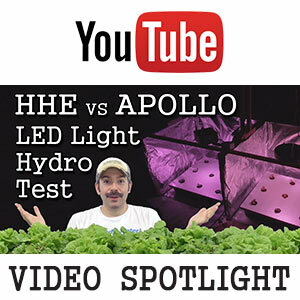 And there can be a lot of confusion, especially with the popularity of LED grow lights. Are certain colors of light a waste of energy? Or do plants actually benefit from a broad range of colors? How does PAR light come into the picture? Watch the video below for a complete explanation. And scroll down further to see a few highlights on the subject. Watch the entire video which includes extra graphics & references! lights emit radiation within the visible light spectrum. Each color has its own unique wavelength, and can be described by that wavelength in nanometers (nm). So a blue light may be 450 nm while green is 550 and red is 680. Travelling left on this graph, towards blue, each photon (or particle of light) has more and more energy. Moving right, towards red, each light wave possesses less energy. Colors of light can be designated by their wavelengths in nanometers. 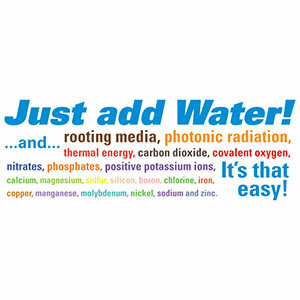 THE FUNCTION OF UV: As you get right outside of the visible spectrum (below 400 nm) you have Ultra-violet light. 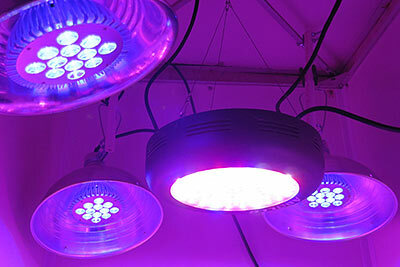 Some grow lights may produce UV radiation in addition to visible light. And interestingly, plants have shown physiological responses to UV with improved disease and pest resistance. HOW PLANTS USE FAR RED: Between 710 and 850nm we have Far-red light, which plants are sensitive to as well. Far-red does less to drive photosynthesis, but can greatly effect plant development or morphology. For example, certain ratios of red to far-red can tell plants that they’re under a canopy of taller plants, triggering them to grow taller in response. This is referred to as a shade avoidance response. A decrease in ratio of Red to Far-Red light can trigger vertical stretching in plants. Of course, the most crucial range for plant growth is within the 400 to 700nm color range. Photons within this range are most effective at driving photosynthesis. This is referred to as PAR light (Photosynthetically Active Radiation). ALL PHOTONS COUNT: Note that this range includes even green light. Plant leaves reflect SOME green light. And that’s why we see them as green. This is good though because it results in improved canopy penetration. For decades researchers have demonstrated that green light serves a useful function and is capable of driving photosynthesis. In fact recent research is revealing some unexpected benefits of green light, even helping with organic pest control! Green light falls well within the range of PAR. The next article offers an interesting perspective on why some LED makers exclude green wavelengths in their grow lights. The point is, don't prescribe to the oversimplified mentality that plants only need one or two colors to thrive. They may live and grow, but that doesn't mean that all other light frequencies are useless and unneeded. Shouldn’t we expect this? Afterall, the PAR measurements used by horticulturists give green photons the same weight as blues and reds. So really a broad, full spectrum light source is a good thing. - not a bad thing. TRADITIONAL OPTIONS: As it turns out, plants respond differently to different combinations or ratios of light. At different phases of growth, certain spectrum profiles may enhance results. Professional growers may switch bulbs as their plants mature and enter their fruiting or reproductive phase. Different grow light technologies will have different spectral compositions. High Pressure Sodium lights are heavier in the yellow through red end of the spectrum. Meanwhile, Metal Halide lamps emit a larger amount of blue and UV. CUSTOM LEDs: The entry of LEDs into the grow light market has resulted in an endless variety of color combinations. Such LED systems may contain multiple diodes, each of which emits a unique narrow band of color. A 3 band LED, for example, may contain 1 type of blue and 2 types of red. Thus, custom tuning of that "perfect" ratio is often sought ought as one LED seller tries to stand out from the rest. Blue LED diode is coated with a phosphor to shift photon wavelengths making white light. LED grow lights are showing more and more color bands. Some even claim to be "full spectrum". This can be achieved by including a few diodes that have a phosphor coating. The coating changes the energy state of photons from a blue diode. The result is a mixture of wavelengths that produce white light. The reliance on phosphor coatings slightly reduces an LED's efficiency rating. But it creates a more rounded spectrum that is likely to support a broad range of plant types. THE DOWNSIDE OF LIMITED SPECTRUMS: In a recent test, I was using a red / blue LED grow light designed for vegetative plant growth. I tried 3 light intensities with hydroponic lettuce under each. Unfortunately, the lettuce exhibited an unexpected shade avoidance respond, stretching vertically. Then I switched to a full spectrum version of the exact same type of LED and the difference was dramatic! Low compact growth, as expected. These are the exact same types lettuce grown under red/blue vs white light! Light quality can have a drastic impact on plant development, effecting the shape and length of plant leaves. This is known as plant morphology. Read more about how green light has been misunderstood in recent decades as discussed in the next article!